Wash duck, pat dry with paper towel. Brush with dark soy sauce. Set aside for 15 mins. Heat 2 tbsp vegetable oil in a large deep frying pan or pot, fry duck until skin is golden brown. Remove duck and wipe pan clean with paper towel. Add seasoning mix, water, star anise, 4 cloves garlic and ¾ of the ginger. Bring to a simmer then gently braise duck for 90 mins. Remove duck from the pot, transfer to a plate, and cover loosely with foil. Rest. Add shiitake mushrooms and rock sugar to pot, bring to the boil, reduce heat to medium and simmer for 10 mins. Combine cornflour with 2 tbsp of water, add to sauce and stir well. Transfer to a bowl and set aside. Heat remaining vegetable oil and sesame oil in a wok or frypan over medium-high heat. Finely chop remaining garlic and ginger, add to wok and stir fry for 2 mins – do not burn. Add bok choy and stir fry for 2 mins, add remaining oyster sauce and stir fry for 1 min. 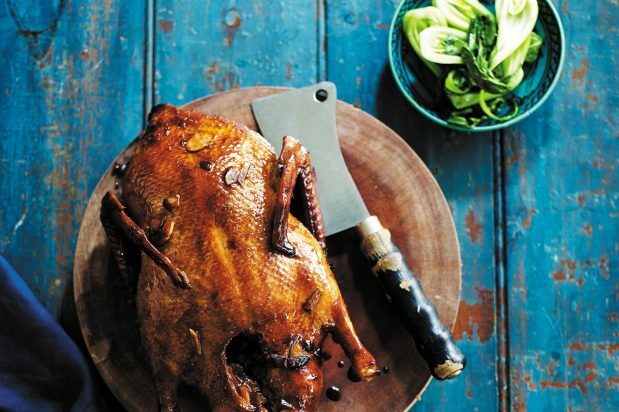 Serve duck with bok choy, mushrooms and sauce.